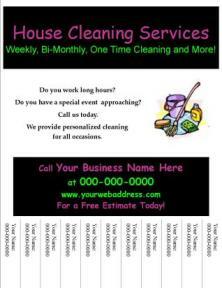 House Cleaning flyer to hand out to potential customers.� More flyers are available in the flyer section on the main product page. More house cleaning flyers are available in the flyer section on the main product page. The flyers are created in Microsoft Publisher. They will be sent in pub, jpg and pdf format with instructions on how to edit the flyer to put your business information on it. We can also add the information for you if you select for us to do so.